With prices skyrocketing for Electricity, Natural Gas and Oil, one simple and economical way to achieve significant energy savings is to upgrade or install Thermal Insulation. When installed, Thermalate sheets will decrease heat transfer between the Mold and Press Platens. This results in more even temperatures throughout the process. Press insulation is a particularly demanding application for any material since it is subjected to high temperatures and molding pressures, as well as exposure to Oils and Hydraulic Fluids. Our Thermalate grades are Compression Molded Glass Mat reinforced Thermoset Polyester laminates. Their physical properties include High Heat Resistance, high Compressive Set, low Thermal Conductivity, low Moisture Absorption, durability, and good machinability. These laminates provide for more precise temperature control as well as uniformity of temperature, reducing or eliminating “Cold Spots” in a mold. 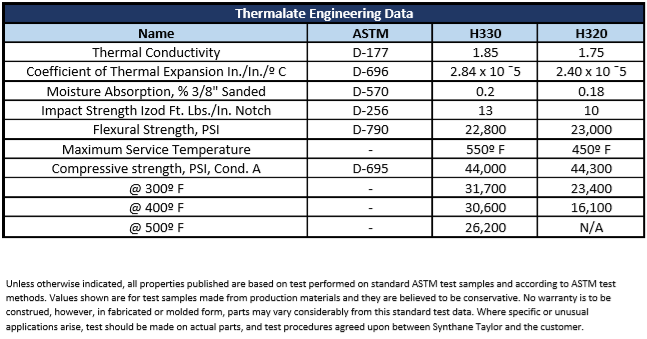 Thermalate composites offer a number of specific advantages over other insulation materials. Since we are a major fabricator, we are able to provide you not only with many varying sizes of Thermalate sheets but are able to fabricate to your drawings’ specifications. With our complete machine shop your Insulating Plates will be ready to bolt on when shipment is received with no further machining. This saves time, saves your equipment, blades and bits as well as keeps the dust out of your air. As well as complete machining, we can also supply these standard size sheets 36″ x 72″ or 48″ x 96″. Sheet size 48″ x 60″ is available upon request – minimums will apply. Special thicknesses from 1/4″ to 2.00″ are available. Thermalate sheets up to ½” thick are sanded on both sides to a tolerance of +/-0 .002″. Thicknesses over ½” are sanded on both sides to a tolerance of +/- 0.005″.